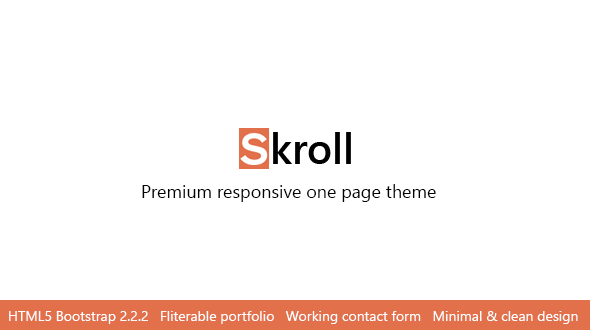 Skroll is a modern responsive theme with a neat and professional look and feel, the single page layout based on Twitter Bootstrap 2.2.2 Responsive HTML5 Framework. Skroll features almost every content patterns needed for your next website, including custom price tables, quick-sand filterable portfolio with Pretty-Photo, one-page scroll and integrated elements from Bootstrap, fully working contact form powered by PHP email sending scripts with HTML5 and JQuery validation. Skroll is extremely easy for ordinary users to setup their own website. But it is also handy to extend the template to any level as your creative freedom. Template includes w3 valid cross browser compatible HTML5 markup. Live preview images are from flickr and sxc.hu where these images are not re-distributed via download pack. Instead exact placeholder images are included. A premium quality web template from Designova.